Data is best when it’s in an easily digestible format. Planning an event is busy work. You don’t have time to manually process all the data you get. When it comes to your event, you need to know key features right away. That’s why we’re pleased to announce a beautiful event dashboard and customizable matchmaking in our event manager. 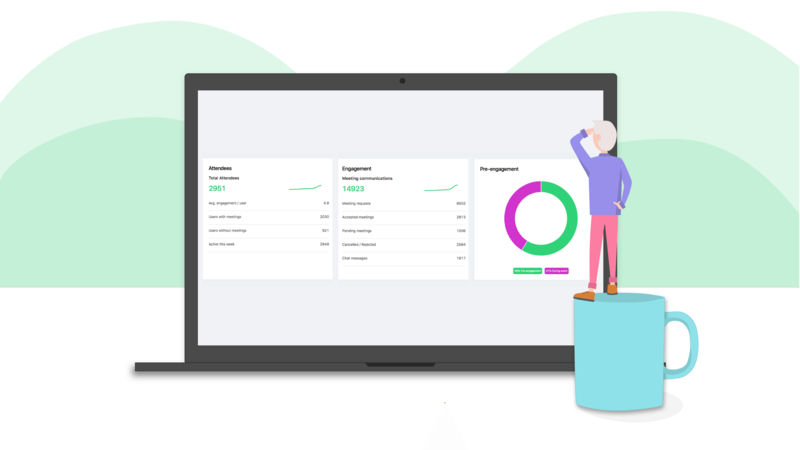 Now you can see key factors of your event at a glance and ensure your matchmaking interests suit your event and your attendees. Let's go over some of these in more detail. 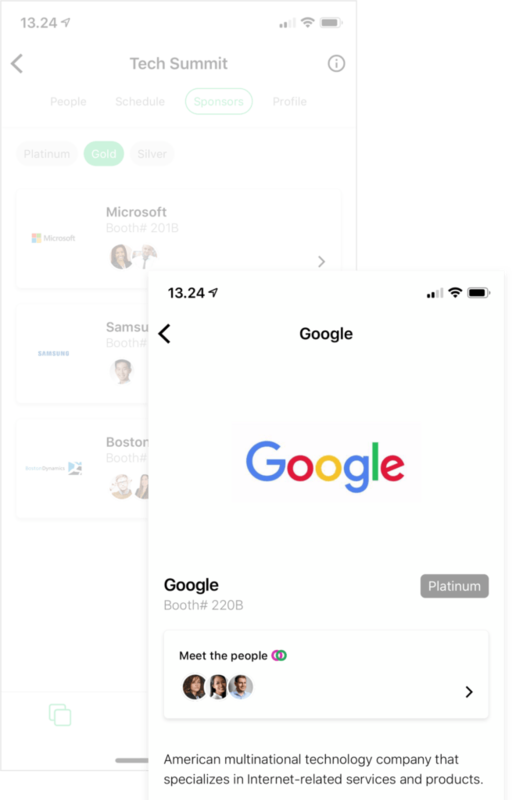 We’ve included a ‘Partners’ feature to give your partners and event sponsors visibility and a great experience. 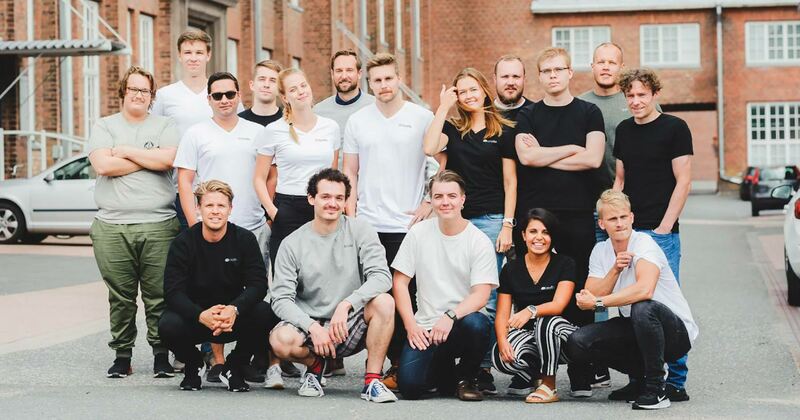 You can choose the levels of sponsorship and size of photos, and any representative from the company can be found there so your attendees can book meetings with them, the same as any other attendee. It’s the easiest way to put your sponsors in touch with their target market - at hardly any extra work from you. A great way to improve ROI for both you and the sponsors. You can learn more about our other event management features here. When your attendees book a lot of meetings, that’s good. 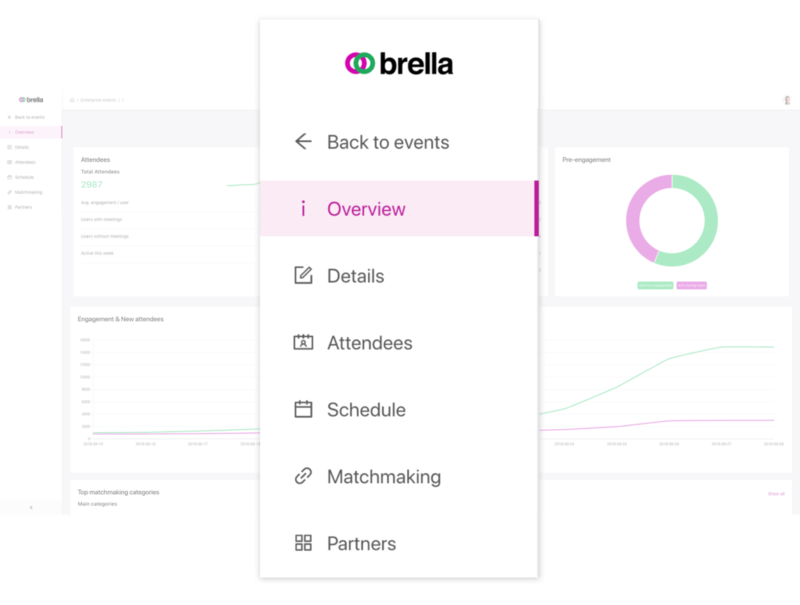 Their meetings are synced automatically to their schedule in your event (more details on that in this blog post) but if they use Brella at multiple events, keeping track of each meeting can be difficult. 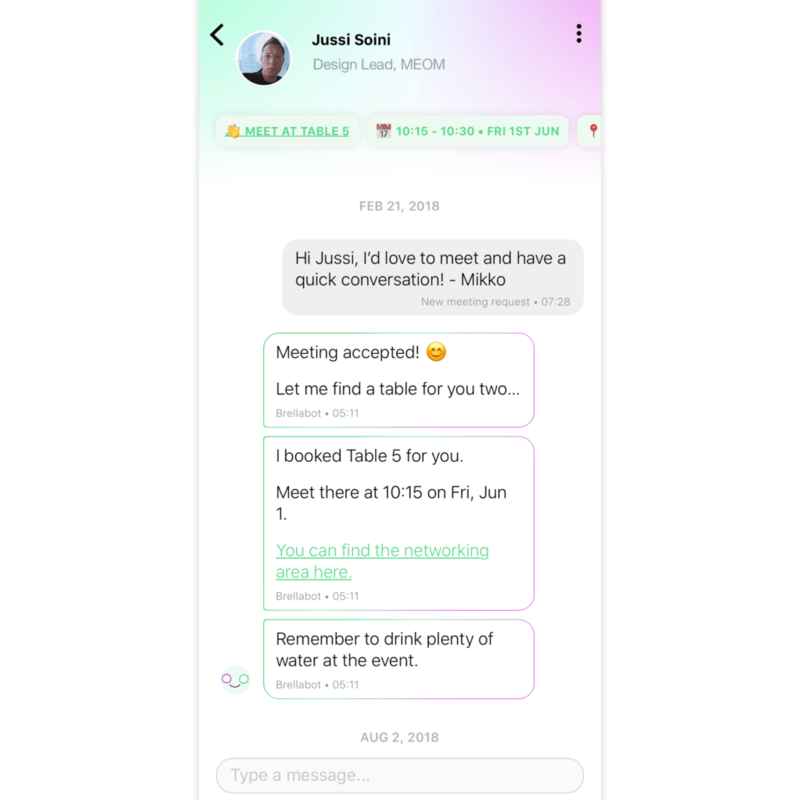 Luckily, all their chats are kept in one place, and now Brellabot will help them get the right meeting information on time. 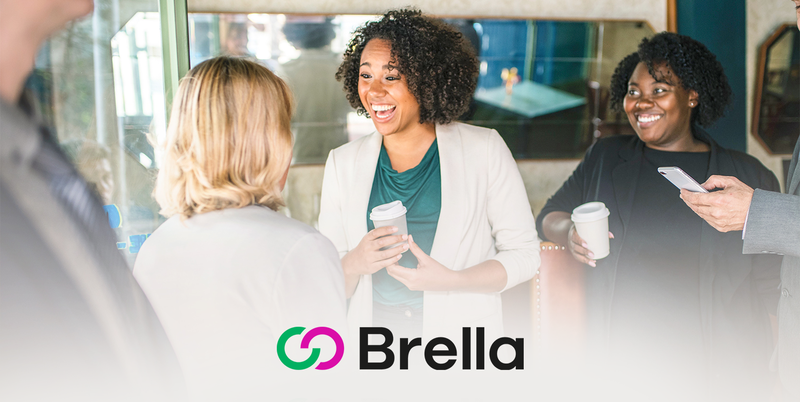 When a meeting is accepted between your attendees, Brellabot will book a meeting spot for them and give their meeting details, like a map of the networking area and a time. Having one person (er, robot) book meeting spots ensures that no table gets double-booked, and Brellabot always knows when tables are full and will inform your attendees accordingly. It’s a smoother experience for your attendees. To read more about our event networking features, click here. We recently created a new schedule, and now we have a new way to help you make the most of it! With our new widget, it’s super simple to integrate your schedule with your event website or event app. No need to create multiple schedules - use ours and share it everywhere. The process takes only a few minutes, and it updates in real time. 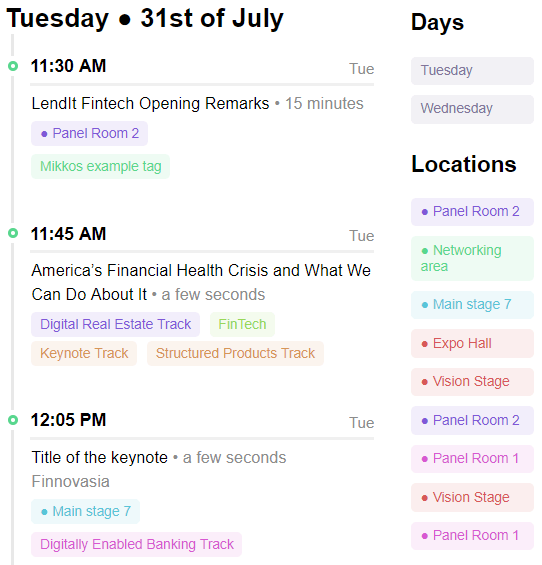 It also has full filter functionality - which means your attendees can sort by tags, location or date to find the best content and sessions for them. Sound simple? It actually is. When you help your attendees connect, they forge powerful business relationships. With a customizable matchmaking interest tree, you can truly make your event your own and stand out from the crowd. Check in next month to learn more about our newest updates! Interested in gathering real-time data on your attendees’ interests at your next event? Contact our sales team to experience the power of networking first-hand, or check out our other product features here. Cover photo by Sanna Kartiovaara.